The establishments along modern day Peel Street are like your typical quirky kids back in high school. Where once they made a ruckus and misbehaved, nowadays they’re mature success stories. All grown up, they look an odd bunch but their various quirks make for a colourful scene. This then is where craft beer joint 99 Bottles has decided to set up shop, right across from the now-vacant premises of VCNCY (how apporpriate) and just up the street from live music joint Peel Fresco and cocktail institution Quinary. 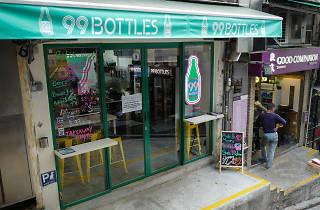 There’s a burgeoning craft beer scene in Hong Kong right now and although 99 Bottles plays it safe, it still offers a taut selection of brews local and international. The space itself is rather small: there’s only one long table inside, which seats about seven and almost forces patrons out of the door, either to enjoy the night air or head elsewhere for a second round. 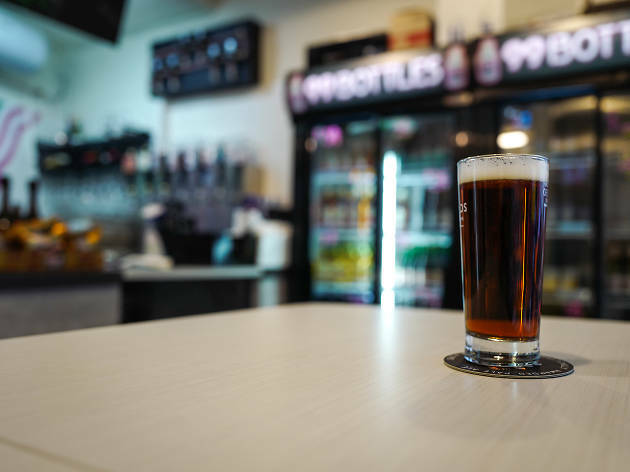 We sit down at the bar, rather uncomfortably on a tall steel stool, and order up two pints from the options on tap: Big Wave Bay IPA, in support of the local scene, and a seasonal brew from Hobsons Brewery from Shropshire in the UK. Both cost an incredibly reasonable $45 a pint, plus $1 for a plastic cup if you’re going outside. The IPA is relatively mild whilst aromatic and dry, evocative of local tea varieties and very much in the spirit of Hong Kong. The Hobsons is more exciting, however. It’s sharp to the taste, mellows out halfway and becomes incredibly herbal near the end. 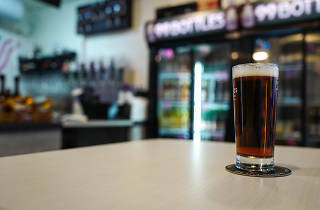 Though wine, sake and spirits are also on offer, it’s clear it’s beer that’s the focus here. In addition to the offerings on tap, there’s a small handful of by-the-bottle brews from all over the world. 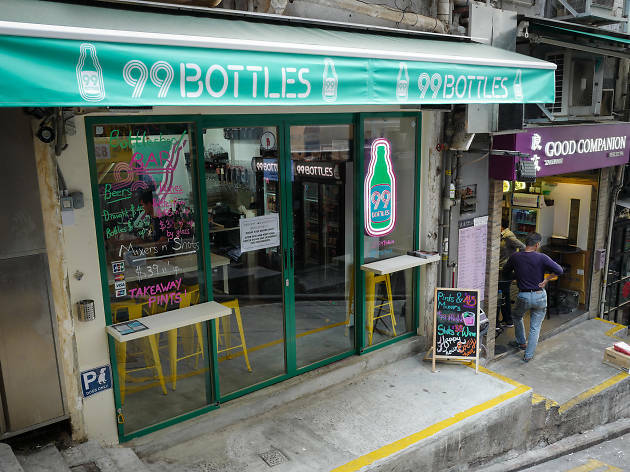 Altogether, though the space is small and the selection thus more limited than the likes of Roundhouse or Little Creatures, we’re excited to have a new addition to Hong Kong’s craft beer scene. If it can be a little more adventurous in the future, it might just cut it on one of the city’s most cosmopolitan streets. Central MTR station, exit D2.